In a related story [being carried everywhere], a few BC firefighters are being “publicly shamed for ignoring the province’s ban on campfires“. Although most of the related comments are critical, some people jumped to the firefighters’ defense. “The BC Wildfire Service has launched an investigation“. London’s famed Victoria and Albert Museum has “Got wood” in a “world-first exhibition on the history of plywood’s technological past, and its contribution to social and economic history“, which includes planes, trains and automobiles and even hat boxes. TORONTO — Canada’s big banks and other companies are donating sizeable sums to the Canadian Red Cross to help the victims of the wildfires in British Columbia. About 14,000 people have been displaced by more than 200 wildfires and an official with Emergency Management BC said Tuesday that the situation continues to deteriorate. The Canadian Red Cross has said cash donations for wildfire victims are coming in at an overwhelming rate from across B.C. and Canada, and with the crisis expected to continue, there is no set goal for fundraising efforts. On Tuesday, Scotiabank, CIBC, Royal Bank and the Bank of Montreal each said they would donate $50,000 to the relief effort. In response to new polices that will significantly impact northern and rural Ontario, a coalition of indigenous and municipal leaders, chambers of commerce, unions and the forest sector have come together to voice their concerns over a lack of meaningful consultation by the Ministry of Natural Resources and Forestry (MNRF). Members of this coalition have been working proactively with government over the last 18 months to develop new rules, also known as “prescriptions”. Despite best efforts and solutions offered by practitioners, the Government intends to rush unbalanced and potentially damaging policy through the approval process without consulting with indigenous communities or municipalities. “The socio-economic impacts of the proposed rules have the potential to be catastrophic for northern and rural Ontario, jeopardizing the livelihoods of 57,000 hardworking men and women in this province,” said Jamie Lim, President and CEO of OFIA. WASHINGTON — New Brunswick Premier Brian Gallant says he remains optimistic his province can be excluded from hefty duties on softwood lumber exports to the United States. Gallant met with United States Secretary of Commerce Wilbur Ross Jr. in Washington on Wednesday to discuss softwood lumber and free trade. Ross is a senior member of President Donald Trump’s cabinet and is responsible for negotiating the Softwood Lumber Agreement. ‘We were very pleased with the conversation,” Gallant said in an interview following the 30 minute meeting in Washington, D.C. “It was very substantive and we went into detail.” … “I argued why New Brunswick should be part of the exclusion we have enjoyed since 1982,” Gallant said. The premier said he stressed the importance of the trading relationship between the Atlantic provinces and the New England states. LEED project use in the US continues to decline, across all rating systems, based on our analysis of the LEED Project Directory database, for projects certified by June 30, 2017. Overall new project registrations fell 75% in the first half of 2017, compared with 2016. Project certifications, i.e., awards to projects already completed, which reflect registrations typically made in prior years, fell 9%, to a total of 1,359, across all major rating systems for new construction, tenant improvements and existing buildings. What’s worse, LEED for Existing Buildings (EBOM/O+M), already lagging in user acceptance, saw certifications fall 25% in the first half of 2017. Clearly, a “carbon neutral” building evaluation program has to have a major uptake by existing buildings. Downtown Chicago hasn’t seen a new wood-construction building in more than a century. But a research team from Perkins+Will, Thornton Tomasetti and the University of Cambridge is out to prove that doesn’t have to be the case much longer. To do so, they are looking at ways to design (and perhaps one day construct) an 80-story, 800-foot-tall mass-timber tower along the Chicago River’s South Branch. The team is thinking so big in part because the changes needed to allow mass-timber structures in new tall buildings around the U.S. are incremental in nature. Having proof of concept (on paper, at least) for how all of that could come together is one step toward distinguishing mass timber in the building code from other forms of wood construction, such as stick-frame and heavy-timber. In a world-first exhibition, plywood is placed under the microscope for an in-depth look at the material that’s full of surprises. From planes, trains and automobiles to tea chests and hat boxes: plywood is the material of the past, present and future. Now, for the first time, an exhibition at the V&A has documented the historic multiplicity of uses of plywood across the globe. …The exhibition space in the Porter Gallery is small but well used with over 120 objects on show. Models of the fastest flying aeroplane of the Second World War, the Havilland Mosquito and a recreation of the self-assembly WikiHouse fill up every inch of the space (which is itself constructed of plywood). Through a range of multimedia resources, visitors are given a history of plywood’s technological past, and its contribution to social and economic history. Brazilian forestry company Fibria, the world’s leading producer of eucalyptus pulp from planted forests, has partnered with Spinnova to further develop the Finnish startup’s sustainable technologies for making cellulosic fibres. …Spinnova develops low-cost and environmentally sustainable technologies for making fabrics, using wood fibres to produce filaments and yarns that can replace cotton, viscose and other raw materials in both woven and non-woven applications. “The partnership strengthens Fibria’s positioning for the development of new high-value products that go beyond the commodity concept and complement our global leadership in eucalyptus pulp production,” says Fibria CEO Marcelo Castelli. The De Havilland Mosquito was the fastest, highest-flying plane of the second world war, its light, streamlined body making it able to outrun all enemy aircraft. So it might come as a surprise to learn that, beneath its sleek lacquered skin, it was all made of plywood – lighter, cheaper and more aerodynamic than the metal equivalent, unhindered by bracing and rivets. It could be easily made, too, by workers in furniture factories, and easy to repair. Yet metal won out, perceived as the more “modern” material. Plywood: Material of the Modern World, a new exhibition at the V&A, is an eye-opening story of design, technology and – as the Mosquito pictured here shows – prejudice and taste. On June 28 and 29th FSC Canada held its Annual General Meeting in Montreal where nearly 100 members, certificate holders and stakeholders attended to hear about the organization’s recent success and learn about its upcoming National Forest Management Standard. FSC Canada’s President, Francois Dufresne, delivered his highlights and successes from 2016 and talked about the future of FSC in Canada, noting that FSC-certified forests in Canada grew by 2.3 million hectares. His report also focused on expansion and collaboration to support the growth of FSC Canada so it can continue to deliver positive social, environmental and economic impacts expected by its members. Canadians are celebrating their heritage all year long during a 150th birthday party with tributes to all things quintessentially Canadian. Maple syrup has been part of Canadian cuisine since before Canada was born in 1867. It was valued by Indigenous peoples who taught the first Europeans to tap trees. In 2017, maple syrup is still helping to define Canada’s deep connection to its forests and the generations of families who have relied on them. Stone Maple Farms syrup is the first forest product not made of timber to be certified to the chain-of-custody standard of the independent, non-profit Sustainable Forestry Initiative (SFI). West Vancouver Sea-to-Sky MLA and provincial Environment Minister Jordan Sturdy says news of potential logging on Bowen Island was brought to his attention several days ago by concerned constituents. He says that Bowen Island is likely one of many places across the province that has received a request for consultation on current Forest Stewardship Plans (FSP), and he is urging islanders to be open to dialogue. …“If the community provided certain feedback on this plan, but that was not reflected in the final version of it then that would indicate a disconnect, and I would step in on behalf of the community,” says Sturdy. “Certainly, the community could say no to logging, that is a reasonable answer. The B.C. Forest Service turned 100 last year. So what did our government do to celebrate? In 2016, it laid off 600 forest rangers, closed their ranger stations and turned the management of our public forests over to the timber industry, but did not tell them they were to do it. The small forest-fire section of the former B.C. Forest Service survived the kill, but what could these few experts do without the large staff of rangers to do the dirty field work? We created a huge problem. …Our climate is getting hotter every year, and we are well aware of it. Next year, the forest-fire situation will be worse than this year. Are we getting ready for it? It doesn’t look like it to me. AGNESS — A 3.2-million-board-foot timber sale federal officials said was designed as a landscape restoration project will reap little financial benefits other than the first major repairs in three decades to a popular forest road. Compared to other sales, the Green Knob timber sale fetched pennies on the dollar from a Brookings mill that will pay $350,000 in culvert replacements so its trucks can use Bear Camp Road ship to its mill enough logs to build 200 homes. Known on maps as Forest Service Road 23, Bear Camp Road is a one-lane, paved road over the Siskiyou Mountains used by lower Rogue Canyon rafters and others. It will be closed for up to two months beginning Monday so contractors for South Coast Lumber Co., the sale’s purchaser, can begin replacing 22 culverts along a 7.5-mile stretch to return the 30-year-old road to log-truck worthiness for fall logging. At some point in the near future, a company called ArborGen envisions an American south blanketed with eucalyptus trees genetically engineered to survive the cold winter. To feed the paper and pulp industry, which ArborGen says is worth $60 billion, plantations dedicated to “purpose-grown” trees should be extensively developed without federal oversight, the company says.They say that their plantations do not need to be regulated because introducing eucalyptus plantations to the south is “unlikely” to harm the local environment. …Rather than deforestation, the company instead pitches its plans as “reforestation.” They want to replace the existing, native pine in states like Georgia with their genetically modified, freeze tolerant eucalyptus trees. The company already has permission to field test its plans across the United States, but is currently seeking approval to expand its GE tree plantations for commercial use. Setting the political issues aside, the logging industry can be viewed in a completely different light. 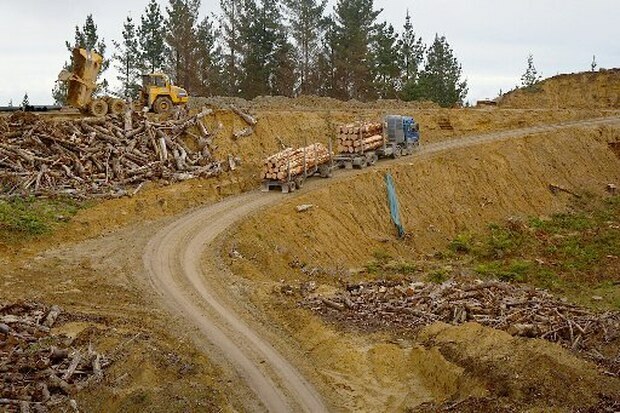 Whanganui-based Hickford Logging is just an eight-man band at the coalface harvesting a 250-hectare pine forest in the steep hills inland from Maxwell, yet an entire community feasts off their labour. The expected 30-month harvest began in November last year with Dave Hickford and his crew working in conjunction with the Forest Management New Zealand (FMNZ) team to formulate a harvest plan. Once up and running the small crew hit top gear felling, stacking and preparing a stockpile of 10-12 truck and trailer loads a day for transport to Port Taranaki in New Plymouth where the logs are shipped to various international markets throughout the world. 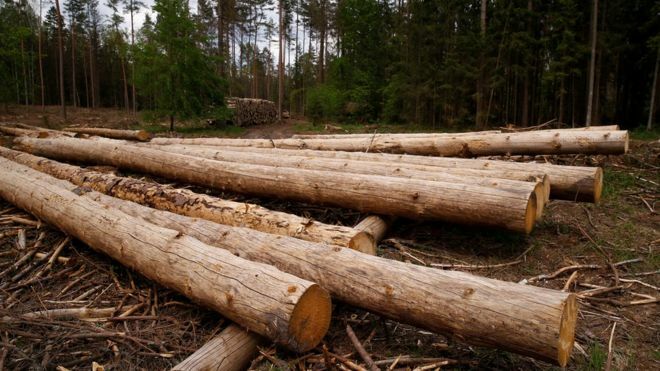 The EU executive has urged Poland to halt logging immediately in one of Europe’s last remaining areas of primeval forest, and has asked the European Court of Justice to act on it. Last year the Polish government decided to increase logging in Bialowieza Forest, a unique ancient habitat and conservation area, three-fold. Unesco, EU officials and green activists protested at that move. The government says the logging can help to curb a bark beetle infestation. But the European Commission says some endangered species are at risk. The forest lies on Poland’s eastern border with Belarus. 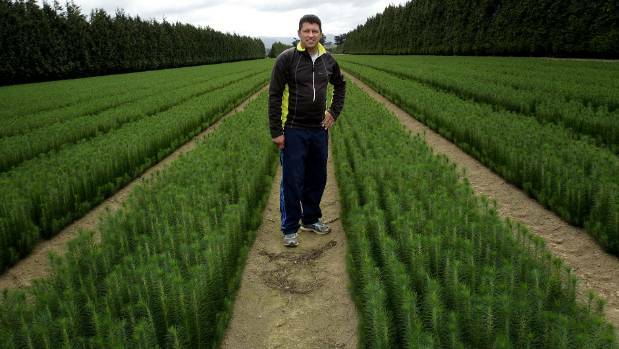 A man who leads by example to the highest of standards has been crowned the Northland Forestry Skilled Professional of the Year. 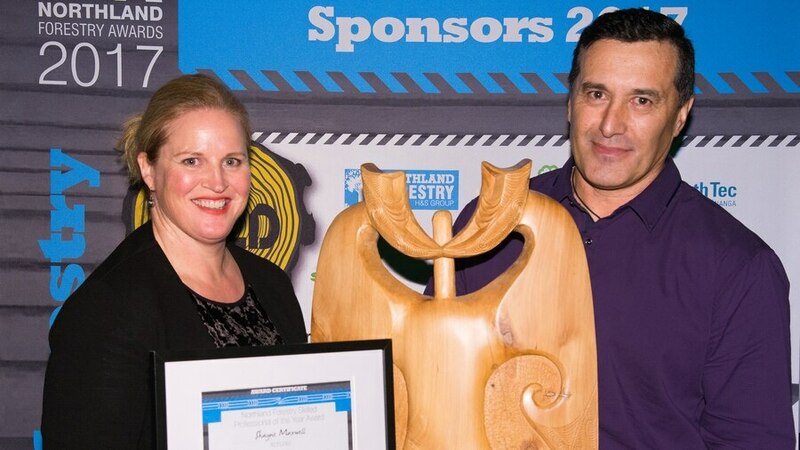 Shayne Maxwell was presented with the title and a trophy by Associate Minister for Primary Industries Louise Upston during the second annual Northland Forestry Awards in the ASB Stadium at Whangarei on Friday. He was nominated for three categories – for health and safety, felling and harvesting, and en route to the supreme award took out the Individual Harvesting Excellence Award, and was joint winner of the Outstanding Health and Safety Management Award. Mr Maxwell works as a health and safety manager and company trainer for Kohurau Contracting, based at Kaikohe, but still keeps his hand in as a faller, breaker out and hauler driver. 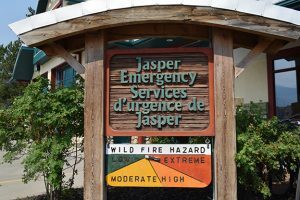 As hundreds of wildfires burn across British Columbia and extreme fire conditions take hold in Jasper National Park the municipality is reminding residents and visitors to be prepared in the event of an emergency. According to Parks Canada, the current fire danger in JNP is hovering between high and extreme and the weather forecast doesn’t look promising. …Should a wildfire start in Jasper he said Parks Canada has a helicopter and a four-man initial attack crew on standby. “When we have these conditions the initial attack crew is on extended hours and they are what we call on high alert,” Smith said, adding the helicopter is also patrolling the park looking for smoke. big story today is the weather. Multiple communities are closely watching the skies to see if the weather could force more wildfires and evacuation orders. The BC Wildfire Service is urging members of the public to stay away from active wildfires wherever they may be in the province. British Columbia’s fire management professionals, hardworking firefighters, aircraft crews and contracted firefighters need plenty of room to do this challenging work. The presence of unauthorized people in these areas represents a significant safety threat — not only for the people attempting to gain access, but also for the crew members who need to concentrate on containing and extinguishing these fires. The public is reminded that they are not permitted to enter areas where an area restriction order is in place and they should also avoid going near any active wildfire site. This is a great concern for the BC Wildfire Service, given the inherent risks associated with wildfires. Although some people may feel compelled to “help out”, they can actually interfere with and delay firefighting efforts. WILLIAMS LAKE, B.C. – As wildfires continue to rage in B.C., a city-wide evacuation alert has been issued for Williams Lake. According to the city, the alert was issued in response to weather forecasts that show conditions could have the potential to push fires to the West of Williams Lake towards the city at a rapid pace. Parts of 100 Mile House have also been told to be ready to evacuate. An evacuation alert is a notification of potential danger. It does not mean residents must evacuate but should be prepared to evacuate with short notice. …According to media reports, the fires are beginning to take an economic toll on forestry, milling and mining operations. Norbord says it shut down its wood panel mill in 100 Mile House. 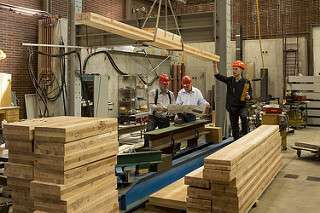 The mill produces oriented strand board, a type of plywood substitute typically used for building houses. KAMLOOPS – The first of 310 firefighting personnel from other Canadian agencies began arriving in British Columbia on Sunday, July 9, 2017, to help the BC Wildfire Service get the upper hand on the 225 wildfires that are burning in the province. Under normal circumstances, the BC Wildfire Service has sufficient staff, aircraft and equipment available to tackle almost any situation that may arise during the fire season. More than 1,600 B.C. firefighters and support staff are in place for the 2017 fire season, and the government can also call on about 2,500 private contractors to pitch in when necessary. However, the extraordinarily high number of wildfires that were sparked from July 7-8 (over 223 new fires over just two days), their extremely volatile behaviour and their rapid spread prompted the BC Wildfire Service to bring in some much-needed help this week. VANCOUVER — Wildfires in British Columbia’s Interior mean only coastal and extreme northern and northeastern corners of the province have escaped a pall of smoke blanketing regions that include the United States border. The Environment Ministry, in collaboration with local health authorities, has issued a smoky skies bulletin as 198 wildfires chew through just under 400 square kilometres of trees, bush and grasslands. The bulletin is issued when smoke concentrations in an area could or have reached levels that raise health concerns although the ministry says the amount of smoke can vary dramatically over short periods and over small distances. A group of B.C. firefighters are being criticized on social media over pictures that appear to show them ignoring the province’s ban on campfires. 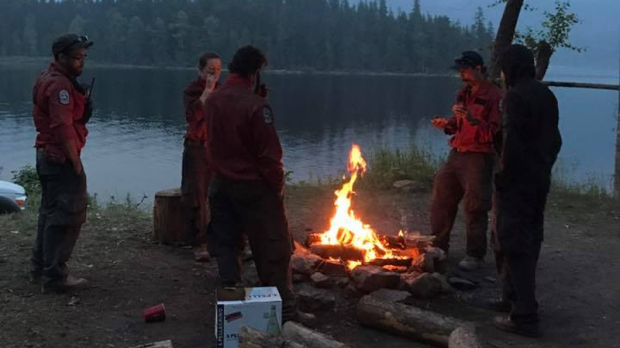 The images were uploaded to Facebook Tuesday night by user Rusty Clark, who claimed he saw the crew enjoying a campfire beside Adams Lake, southeast of the wildfire threatening the community of Little Fort. “Can somebody please report these idiots for me,” Clark wrote. “I’m having troubles getting out on my cell booster.” …”We are aware of that situation and we at B.C. Wildfire Service are taking it very seriously,” said fire information officer Justine Hunse. “We are looking into that situation right now.” Though most of the comments on Clark’s Facebook post were critical, some people jumped to the firefighters’ defence. The public can expect to see extra smoke in the Cariboo Fire Centre region as BC Wildfire crews hope to conduct some controlled burns today. 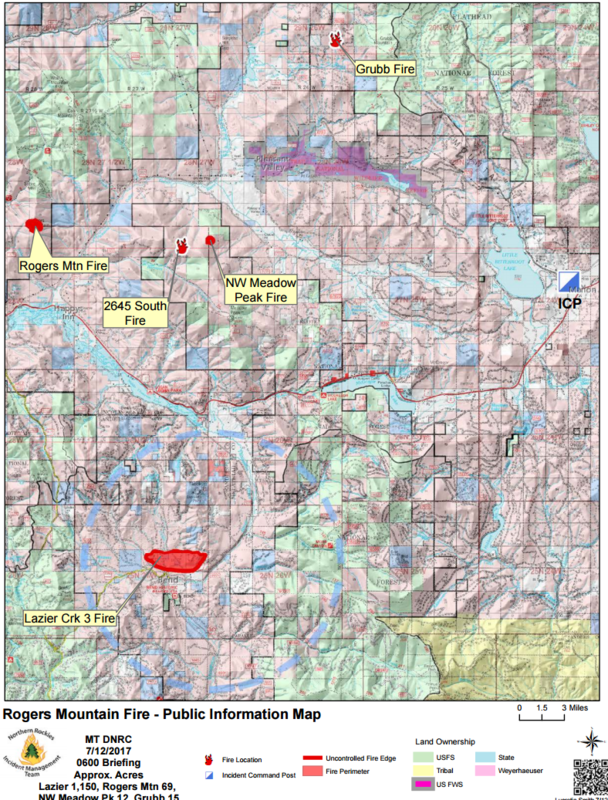 …“The objective today is to continue to construct control lines,” said fire information officer Noelle Kekula of efforts being extended on the White Lake fire. “If weather conditions permit, a controlled burn may be conducted today, which will produce additional smoke for a period of time.” …The other ones closest to Williams Lake and into the Chilcotin are the 150 Mile House, Wildwood/Williams Lake Airport, Spokin Lake Road, West Fraser Road Complex, Soda Creek, Hanceville Fires, Kleena Kleene Complex and the Castle Rock/Twan Lake Complex. BC Wildfire Service crews will conduct a controlled burnoff operation on the south side of the 150 Mile House fire today (July 12, 2017) to create a clear and safer perimeter where ground crews can work. Fire officials say they’re relieved by a slight reprieve in the weather forecast that had been calling for strong winds where dozens of fires are burning. …“We are expecting there to be some lightning with this system but it is likely to have some rain with it,” he said, adding the overall pattern is for hot, dry conditions to continue. “We were a little bit more concerned about today’s wind, but the forecast has shifted a little bit and we expect it’s going to be milder than first thought, but wind is a tricky thing to forecast so we are bracing for the worst and keeping a close eye on it.” he said in an interview Wednesday. The number of evacuees remained estimated at 14,000; 7,886 had registered at provincial evacuation centres and 3,500 households had registered with the Red Cross. A wildfire in the Victoria area was contained within a few hours Wednesday, but not before it forced evacuations and destroyed a home. The small house along Sooke Road in Metchosin, west of the city, was damaged by flames and water as crews fought to get the fast-moving brush fire under control. Highway 14 was also closed for several hours. Fire officials say no people or animals were hurt. Fire crews were called to the blaze near Kangaroo Road at around 3:30 p.m. PT. …Langford Fire Chief Chris Aubrey says one man was home at the time and had to be removed from the destroyed house when his efforts to fight the fire were unsuccessful. Firefighters expanded their efforts in south-central Oregon and the Columbia River Gorge on Tuesday, responding to reports of new wildfires. Officials have controlled a pair of fires that cropped up in Lake County: a fast-moving, 466-acre fire that prompted the evacuation of a building and the Hart Mountain Hot Springs Campground and a 980-acre blaze burning in dry grass and sagebrush near Alkali Lake. And in the gorge, a one-acre wildfire is burning on cliffs west of Oneonta Gorge, closing trails and a section of the Historic Columbia River Highway until further notice. Officials reported on Wednesday minimal growth in the human-caused Ana fire, which is the largest in the state at more than 5,800 acres. An evacuation notice for some area residents has been downgraded from “be set” to “be ready” — the lowest of three evacuation levels. Additional crews and fire engines have arrived to fight five separate fires in the Highway 2 corridor. The largest is the Lazier Creek 3 Fire, at an estimated 1,140 acres. It is now being called 30 percent contained. It’s located south of Highway 2 and west of the Thompson River Road. Today firefighters will continue to improve and construct fireline on the south and eastern portions of the fire with hand crews and heavy equipment. Helicopters will again offer aerial assistance utilizing bucket drops. Crews working on the north, west and southwest flanks of the fire will continue to hold and improve fireline. A structure group will be assessing structures in the area and begin structure. Located north of Loon Lake off Highway 2 and west of the N. ACM Road the Rogers Mountain Fire is now 45 percent contained. 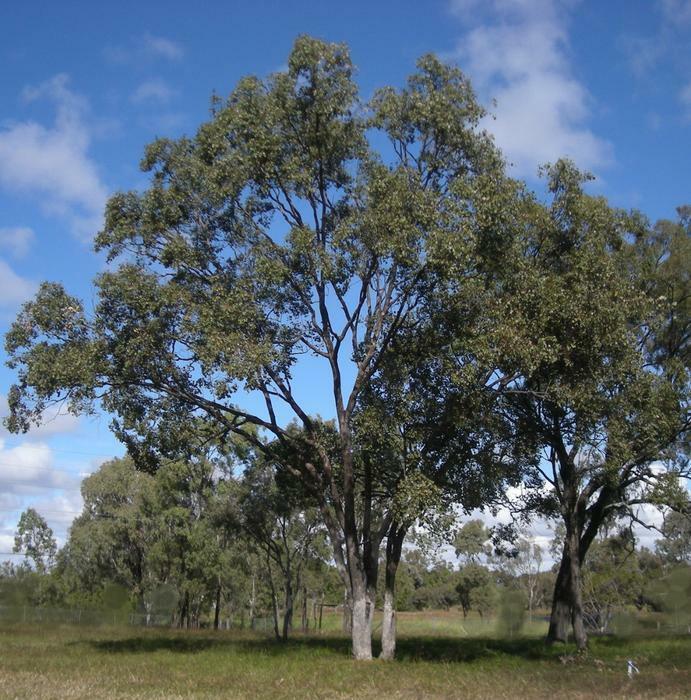 Scientists found that certain species of trees will not rapidly advance uphill as global temperatures rise. 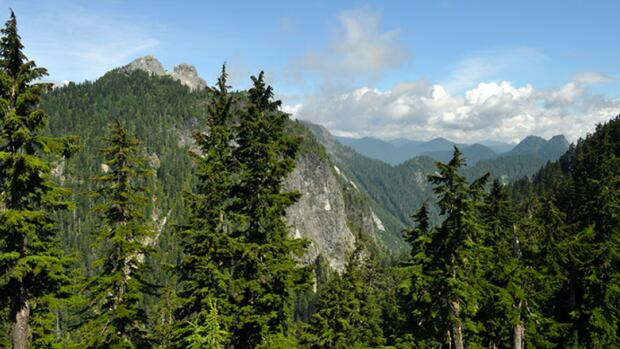 In other words, subalpine forests will not follow the climate up the mountain. 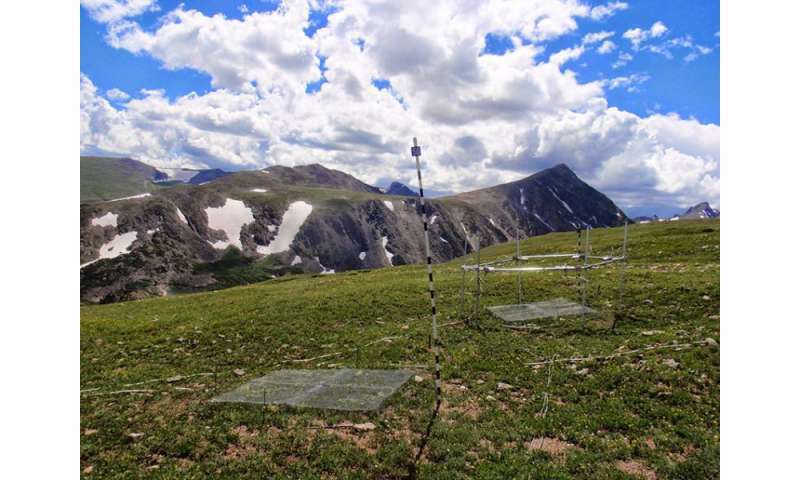 Using field experiments in the Rocky Mountains, scientists tested how two types of emerging tree seedlings responded to artificial warming and watering at three locations. They found that Engelmann spruce may not move to higher elevations as temperatures rise. Further, the spruce may die off at lower elevations. Its overall range could shrink. The hardy limber pine may advance upward, but likely at the same slow pace as in today’s climate.